Winter isn't everyone's favorite season in Toronto. Snow, wind and cold temperatures can make it tempting to stay indoors. But that would mean missing out on some fun (and budget-friendly) cold weather activities. Embrace the season while also saving money with some of the best free and cheap things to do in Toronto in the winter. Harbourfront Centre on a Saturday for a DJ Skate Night. From 8 p.m. to 11 p.m., Natrel Rink turns into one of the biggest winter parties in the city, complete with local and international DJs getting skaters moving and grooving on the ice. The free event runs between December 15 and February 16, 2019. If you’re a beer fan, why not escape the cold and learn something new about your beverage of choice with a brewery tour. Steam Whistle Brewery offers 30-minute tours where you can learn all about the brewing process and chat with employees behind the scenes, and, of course, taste the finished product. One of the most fun free things to do in the winter has to be busting out a sled and heading to a snowy hill for an afternoon of tobogganing. There are numerous spots to choose from in Toronto no matter what neighborhood you’re in. Some good options include Trinity Bellwoods Park, Cedarvale Park, Centennial Park in Etobicoke and Christie Pitts Park. Pretend winter doesn’t exist for a couple hours with a visit to one of Toronto’s indoor gardens that help keep summer alive year-round. Three free indoor gardens to explore in the city this winter include Centennial Park Conservatory, Allan Gardens Conservatory, and Cloud Garden Conservatory. All three offer a chance to forget about the cold for a while and check out some beautiful tropical foliage. The annual Winterfolk Blues & Roots Festival is back for another year taking over five venues on the Danforth from February 22 to 24, 2019. The blues, folk, and roots festival will feature over 150 artists on five intimate stages in a series of both free and paid events. Tickets for some of the paid events start at just $10 if you buy in advance. A three-day weekend pass is just $15 and gets you into all of the venues with the exception of five ticketed shows. You might not think about swimming when you think about winter, but diving into an indoor pool can be an easy way to stave off the winter blues and make it feel as if it’s still summer. The City of Toronto operates 60 public indoor pools in the city so you have lots of options in terms of where to take a dip. Admission to the pools is free for leisure swimming. Toronto’s Historic Distillery District will once again be transformed into a wonderland of lights courtesy of the Toronto Light Festival. The free event comes from the creators of the popular Toronto Christmas Market and features light-based installations from both local and international artists. See it between January 18 and March 3, 2019. Bundle up and head to Toronto’s east end to check out Winter Stations where teams of artists and designers will transform lifeguard stations along the waterfront (from Woodbine to Victoria Park avenues) into temporary interactive art installations. The exhibit opens on February 18, 2019 and will run until April 1. The theme changes every year, and this one will focus on migration. 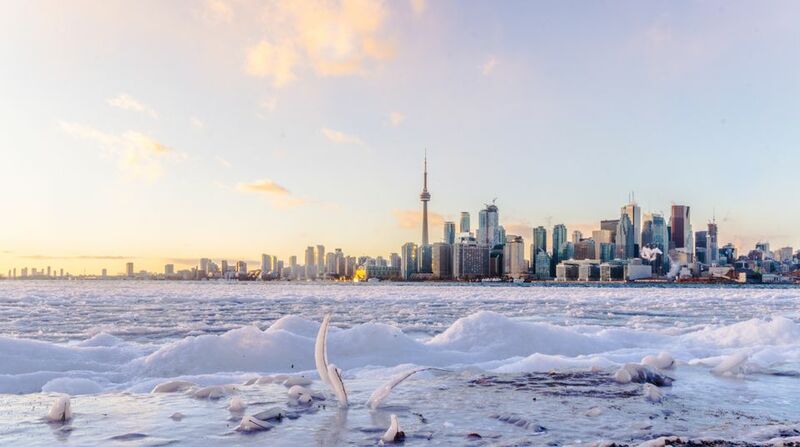 Embrace the cold weather season with a visit to Ontario Place, which is once again hosting a massive winter festival (free admission) running between November 23, 2018 and March 17, 2019. You can expect a skating rink (skate rentals available), bonfires, trails of sparkling fairly lights, and the Winter Lights Exhibition featuring 18 eye-catching installations. In addition, the festivities will also include the Aurora Winter Festival, running November 29 to December 30, 2018 just in time to get everyone in the holiday spirit. Here, you can look forward to carnival rides, Santa’s workshop, market vendors, and much more. Curling up with a good book is a great way to while away some winter hours but there’s more to your local library than checking out a few bestsellers. Stay out of the cold, and learn something new with a trip to a branch near you. Toronto’s libraries offer a slew of free classes covering everything from crafts and hobbies to technology, health, and job search skills among many other topics.